I know this is not Rachio related but there are experts here so I thought I should ask. I moved in this house in the spring so this is my first “winterization”. The guy came with the air-compressor and blew out the system and removed the backflow device. My question is how do I drain the pipe from the supply line to the backflow device? My irrigation system supply line tee’s of the main supply from the basement and there are no “drain screws” (or similar things to drain). I can also see that before leaving the inside of the basement the pipe has a L connector and goes down 6 inches then outside of the house (where are the more pipes that I cant see beyond that). 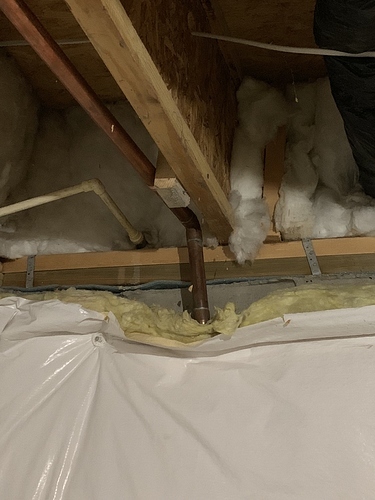 Even if there was a drain screw, it would only drain right where the pipe leaves the inside where there is a 6 inch drop as the water isn’t going to travel up to drain. Has anyone seen something like this? Can there be another way to drain this? I am afraid that the pipe from backflow until it hits the house (and is air conditioned after that) still has water in there. From what I can tell the system was installed less than 5 years ago. Let me know if anyone has any ideas. A picture would help, but if I understand correctly there’s a 6-inch drop inside the house, then out to the backflow. If the backflow’s been removed and the line drained by gravity back to the L-connector inside the house, I think you should be OK. There’s no water left outside to worry about. Here’s what I’m assuming you have. If there’s a 6" drop on the downstream side of the valve before it goes through the wall water should drain. Thanks for drawing the picture . It’s actually flipped upside down. I took a picture. You can see the pipe exiting the concrete. That is the east wall. The backflow pipe comes out on the south side. I have no idea where the pipe goes from here to reach the backflow device - probably under ground outside. So, just to be clear, the water is flowing into the concrete wall in this picture? And somewhere upstream (out of the picture) is the shutoff valve? 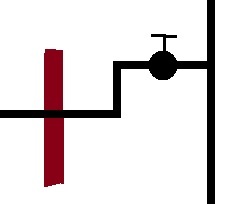 You’re probably right, the line exits the foundation wall, goes underground, and I presume it comes up out of the ground to connect with the backflow valve. If all that’s true, then it does sound like you do have a low section of pipe that’s not going to drain. The only correction would be to find the low spot and tee in a drain valve. If that’s outside and under ground, a buried sprinkler valve box would give you access.